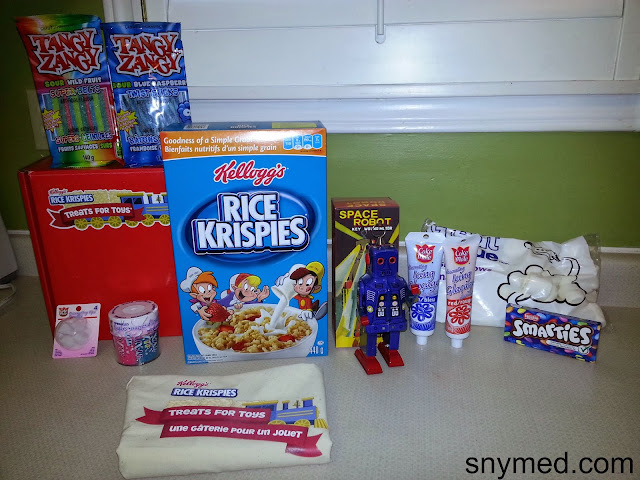 Make Rice Krispies Squares: Princess, Racecar, Dinosaur, Robot & Train! With Full Printable Instructions! 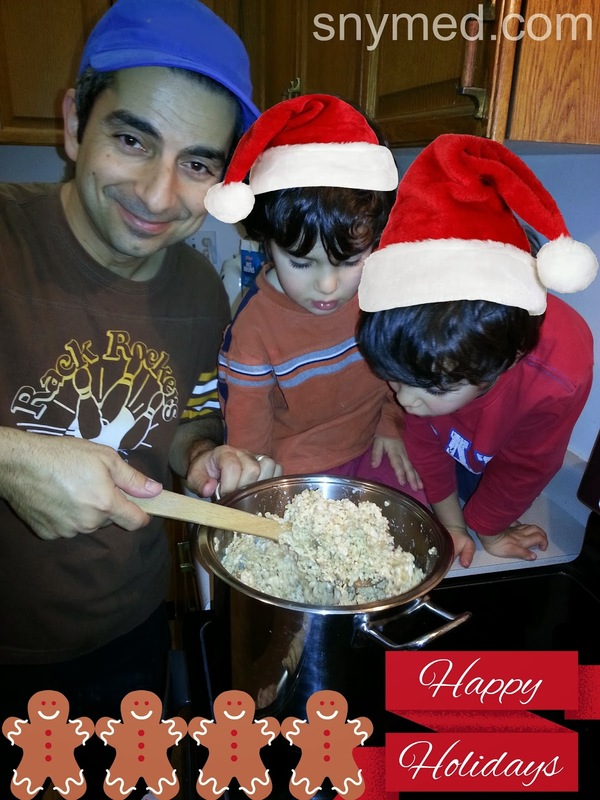 Dad & The Boys Making Rice Krispies Squares! 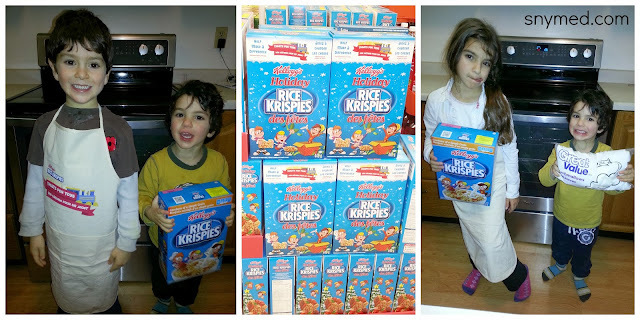 My kids love to make (and eat) Kellogg's Rice Krispies squares for special holidays and events: birthdays, Christmas, Halloween, Valentine's Day, and more. They also love to help out kids both locally and nationally. This week they had a chance to do both, and decided to participate in the Rice Krispies Treats for Toys programme from Kellogg's, which funds toys for children across Canada via The Salvation Army. At this time of year, it especially hits home for my kids that while they are receiving gifts for the Holidays, other children may not be as fortunate. 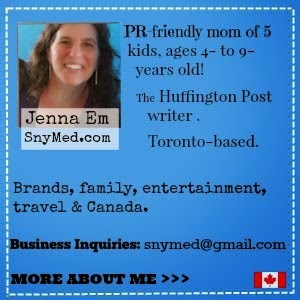 My kids begin clearing out unused toys, games, books and clothing in November, and we try to gift them to charity by early December. 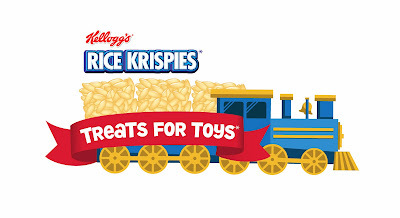 It's simple to participate in The Rice Krispies Treats for Toys Programme! Just make a toy-shaped treat using Kellogg's Rice Krispies cereal, take a photo with a digital camera or smartphone, and upload the photo to RiceKrispies.ca. For every original photo uploaded to the website, Kellogg's will donate $20 to The Salvation Army, up to a maximum of $30,000! The Salvation Army will use this donation to purchase toys for kids in need across Canada this holiday season. It's easy for you to participate too, click here for more details! The Rice Krispies Decorating Kit Used In This Blog Post! We first started with this Rice Krispies decorating kit, that you see above. The Rice Krispies recipe itself is quite simply, and consists of Rice Krispies, marshmallows and butter (or margarine). The original Kellogg's Rice Krispies squares recipe can be seen here, and I've copied it from the Rice Krispies website, below. 1. In large saucepan over low heat, melt margarine. Add marshmallows; stir until melted and well blended. Remove from heat. 2. Stir in vanilla. Add cereal, stirring until coated. Getting Ready to Make Rice Krispies Squares! The kids were glad to don aprons and help make the special Treats for Toys Rice Krispies squares! In this recipe we used the regular Rice Krispies cereal, but you can also use the Holiday kind, shown above (center)...or any of the other varieties (gluten-free, etc). We decided to create a Rice Krispies squares princess to submit to The Rice Krispies Treats for Toys Programme, shown below. 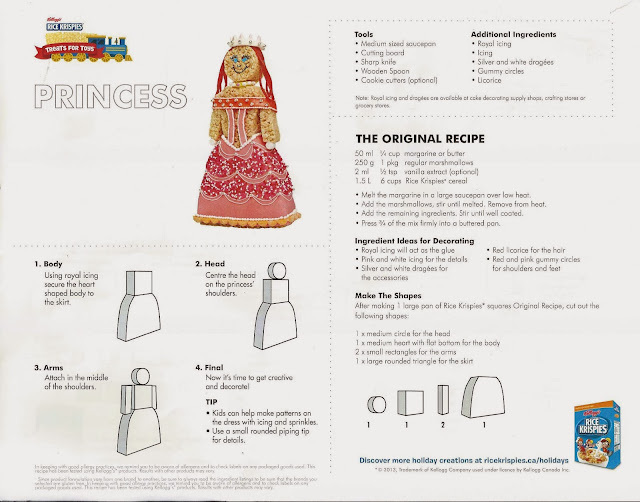 I have included the "proper" instructions to make the princess, below, but I'll tell you how I made it (as I did not follow the instructions). When the Rice Krispies mixture was complete (melted butter and marshmallows coating the Rice Krispies cereal), I sculpted the princess, below. It was done when the mixture was still warm, and NOT after it had cooled in the fridge. Our Princess Made From Rice Krispies Squares! On a greased sheet, I made a round ball for the princess's head and pressed it flat. Then, I added a rectangular neck, attached it to a triangle dress, stuck on 2 rectangle arms, and 2 rectangle legs. I made a princess crown by using a rectangle for the base of the crown, and added 3 rectangle peaks for the crown. I made the wand by hand-sculpting a long, thin rectangle and attaching a small ball on top. While still warm, I added a Smarties face and attached it with icing sugar. I cute a Smarties candy in half to make the nose. I used Smarties to also decorate the crown and wand with "jewels". Icing sugar made the princess's face, hair, heart and embellishments. "Tangy Zangy" (or any flat ribbon candy) made the princess "dress", and "Tangy Zangy" (or any long thin tube candy) added length to the princess's hair, wand, and trimmed her dress. Everything was glued down by icing sugar. I also used candy sugar "sparkles" to add a little bit of fun to the princess! How to Make a Princess Out of Rice Krispies! Click This Image, Above, To Get a Downloadable/Printable Copy! 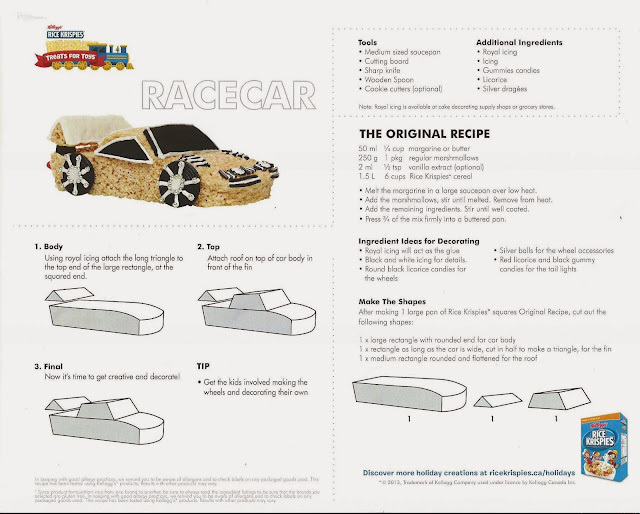 How to Make a Racecar Out of Rice Krispies! 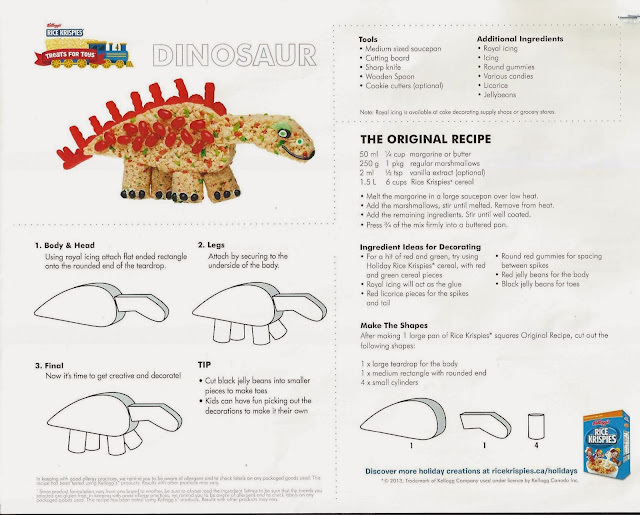 How to Make a Rice Krispies Dinosaur! 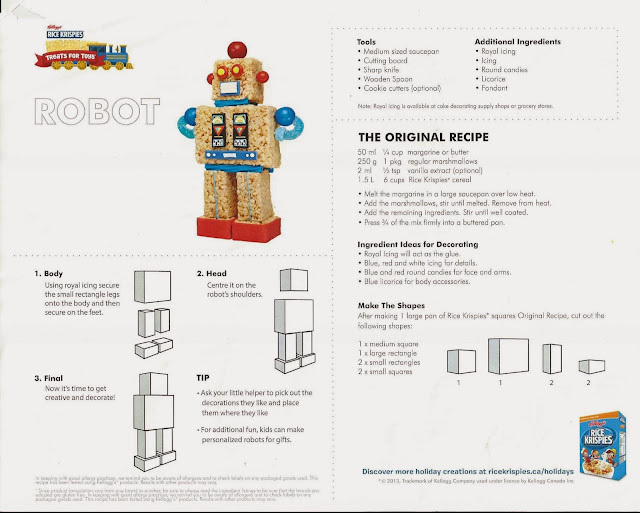 How to Make a Rice Krispies Robot! 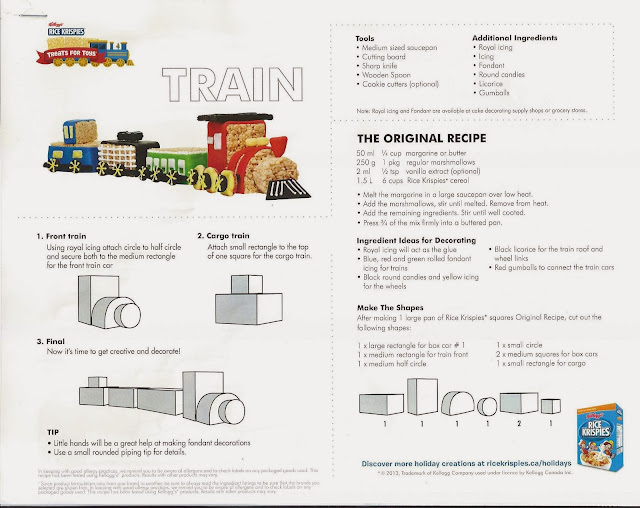 How to Make a Rice Krispies Train! Do your kids or grandkids enjoy making Rice Krispies squares with you? 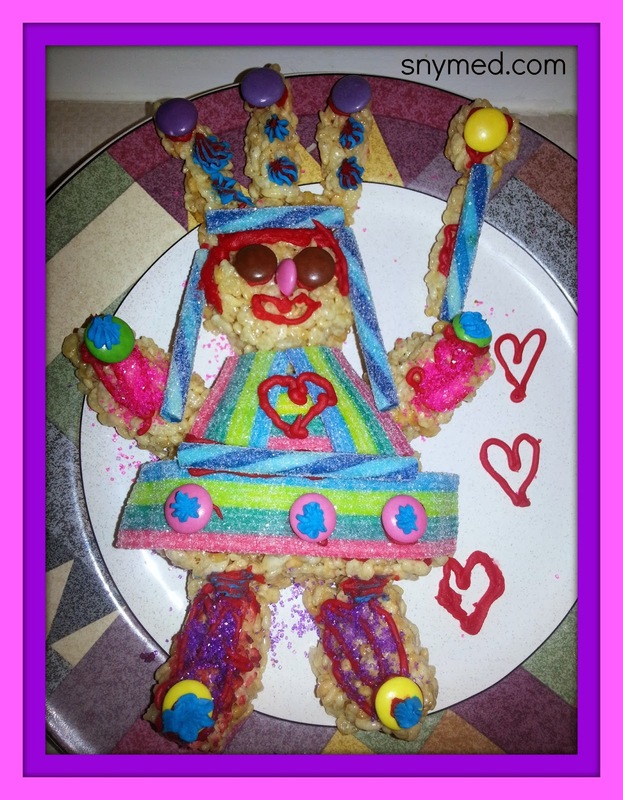 What is your favourite Rice Krispies creation shown on this blog (ie: princess, racecar, dinosaur, robot or train)? Would you be interested in creating your own for "Rice Krispies Treats for Toys"? I just picked up all the stuff we need to make this tomorrow with the kids. My son has his heart set on making the race cars and the dinosaurs. It's going to be so much fun! I love how they give you step by step instructions, including the exact shapes you'll need! Thanks Jeannie! Please let me know how your creation turns out! Love rice krispies squares! My kids love to get creative with them too! I love to munch on them too--in moderation, of course! love rice krispie squares. The robot is super cool! We will have to try it. Amy, their very tasty and easy to make. The robot is definitely cute. Thanks Jana! All the kids fought over who got to eat her head! Rice Krispie treats are always a huge hit in our home Jenna, LOVE them! I love this idea though for having a fun family activity, while helping to raise money for charity, especially at Christmas <3 Great job on the princess! Thanks Suzanne! I love how Kellogg's will donate $20 to The Salvation Army for every toy-shaped treat. These are great ideas! A few years ago I participated in a similar Rice Krispie contest and we created a 3D polar bear! It was lots of fun! You guys did a great job on your princess! Thanks Jennifer! A 3D polar bear would be AWESOME! Love it! Looks like you kids had a great time. And what a great program to support as well. Have fun with the family AND help out your community.